One season it's a sleigh, the next it's a wagon. 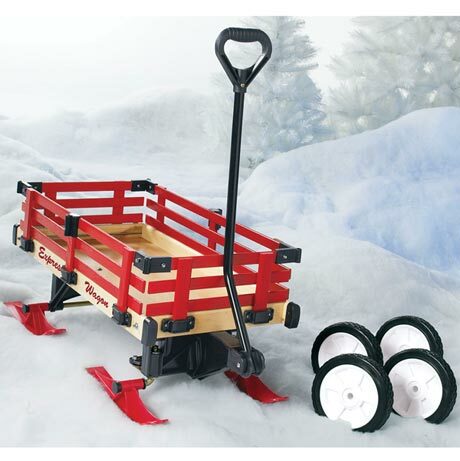 Solidly built from Canadian hardwoods with removable side rails, heavy-duty undercarriage, anti-tip steering, and extra-long handle with comfy grip, it's year-round fun for little ones. 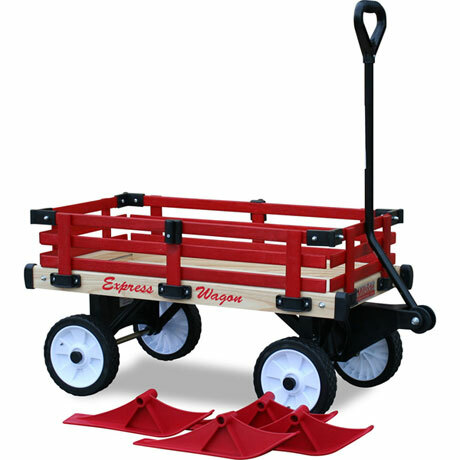 Rugged, high-impact polypropylene runners are great for pulling kids across snow or ice. 8" no-flat tires roll smoothly on sidewalks or trails. Change runners for wheels (or the other way around) in minutes. Deck size 16" x 34". Maximum weight 300 lb. Some assembly required. No gift box. Please allow 4-6 weeks for delivery. Item can only be shipped within the Continental US. Extra shipping charges for this item: $14.95.